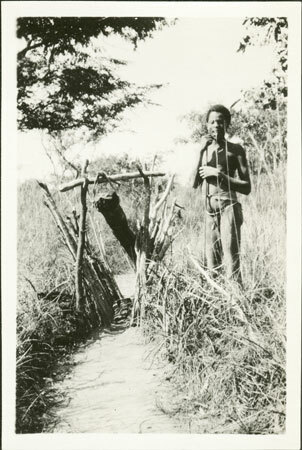 A youth standing next to what seems to be a trap for small animals, consisting of a fenced narrow walkway with a large log suspended above. As the animal enters the gap it evidently would trigger the log to fall, trapping it underneath. The image was taken by A. N. Tucker, who worked as Linguistic Expert of non-Arabic Languages for the Sudan Government from 1929 to 1931. Evans-Pritchard met Tucker when the latter visited his fieldsite in 1930, after which time he gave him these prints. Morton, Chris. "Nuer game-trap" Southern Sudan Project (in development). 03 Jan. 2006. Pitt Rivers Museum. <http://southernsudan.prm.ox.ac.uk/details/1998.355.578/>.